LWPC is celebrating 40 YEARS of service to women in and around our community! Show your support by making a donation during the 40 for 40 Campaign! 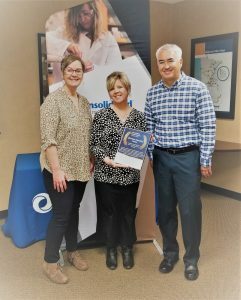 Life-Work Planning Center extends our thanks to the Consolidated Communications Community Fund of the Mankato Area Foundation for being awarded a 2019-2020 grant of $5000 to provide services to women in transition. Life-Work Planning Center is the only workforce development program in the Region Nine Area designed specifically to meet the unique barriers of women in transition and displaced homemakers. We are designated to serve residents of Blue Earth, Brown, Faribault, LeSueur, Martin, Nicollet, Sibley, Waseca, and Watonwan counties, and are available to provide services to residents of neighboring counties that do not yet have programming. Our mission is to increase the emotional and economic self-sufficiency of women and their families. Consolidated Communications proudly provides financial support to non-profit organizations and programs making a difference in Southern Minnesota. Over the last 50 years, the Community Fund has awarded more than $6 million to organizations and initiatives focused on education and critical community needs. Thank you for your support! Tax–deductible donations are always appreciated. We never rent, sell, or share your information to anyone.